The Czech economy has finally recovered from the effects of fiscal consolidation. Given the relatively low level of debt burden in both the government and private sectors and the ‘growth-friendly’ monetary and fiscal policies, recovery over the period 2015-2017 seems assured. 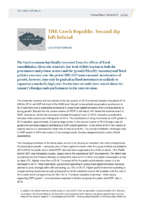 Acceleration of growth, however, may only be gradual as fixed investment is unlikely to expand at a markedly high rate. Doubts have recently been voiced about the country’s foreign trade performance in the years to come.